This set of five G&S overtures conducted by Arthur Fiedler was issued in 1952. My copy (the 10" LP version) has a number of skips and pops, but the recording seems to me up to Fiedler's well-known standard. The original set was issued on 45rpm records and 10" LP. Later in the 1950s, four of the overtures were issued on 12" LP coupled with medleys from several Broadway musicals. The overtures to The Mikado and The Pirates of Penzance were also issued on a single 45rpm disc. The Boston Pops Orchestra, a New England institution for just over a century, began its glory years in the late 1920's under Arthur Fiedler's direction. Fiedler led this sub-group of the Boston Symphony Orchestra for just about 50 years, making numerous recordings — most of them for RCA Victor, which had a long-term relationship with the Symphony beginning in 1917 through to the end of the 1960's. Among Fiedler's specialties was his vast repertoire of overtures, which he always tapped for use in the first portions of his Boston Pops concerts. It is therefore not surprising that he issued a collection of G & S overtures in 1952. If the choices are restricted to five, it's difficult to argue with the selection upon which Fiedler and Victor decided. Although Sullivan himself wrote only two of the five, the three written by assistants (Mikado, Pinafore and Pirates) are so well known and, arguably, loved that the company could hardly omit them and expect the best possible sales. The Boston Symphony was, in 1952 (and, indeed, remains today) one of the world's great orchestras, usually ranked among the top ten or five. Even the Pops personnel (in basic terms, the membership of the Symphony minus the first chair players) were probably, player for player, never excelled and rarely equaled in quality by other ensembles playing Gilbert & Sullivan — and this is saying quite a lot, when one considers that the London Symphony Orchestra, the Covent Garden orchestra, and the orchestra of the Academy of St. Martin's in the Fields are among the distinguished ensembles in this exalted company. Ranking Arthur Fiedler against Malcolm Sargent, Charles Mackerras, Neville Marriner or even Bramwell Tovey and Isidore Godfrey is another matter. Fiedler was known as an accomplished conductor — one of the finest "stick men" in the business. But he was not raised in the English tradition, and neither were most of the players in the Boston Pops. In listening to these recordings, one must be impressed with the sheer virtuosity of the playing while, at the same time, recognizing that something is not quite right about the performances. First, the good news. The recording sessions apparently took place in Symphony Hall, Boston — acoustically, one of the top two or three halls in the world, and probably the finest in the Western Hemisphere. A virtuoso orchestra, recording in such an ideal acoustic, is thrilling to hear. When the woodwinds or the strings strut their stuff, they absolutely flaunt it. When the brass have an opportunity to shine, they blaze. They can make an ordinary brass section sound understaffed. It's hard to believe that these are all the original orchestrations, when one is listening to a string section far larger than Sullivan ever expected for the pit band of a Savoy opera, with brass musicians who could blow the roof off when playing Mahler or Richard Strauss. Herein lies a problem. Sullivan wrote for a compact ensemble, not a sprawling one, and for a theater which held little more than 1,000 people. The scale of the Boston Pops performances is so large than the music often seems overwhelmed. Fiedler's sometimes fast and unyielding tempi, which seem to owe much to the Toscanini approach which then dominated the orchestral scene, are often unkind to Sullivan's music. The fast 6/8 sections of the Iolanthe overture are so rapidly played that the curve of the musical lines gets spun around in an unpleasant yapping, sing-songy style. The brass motives in the Yeomen overture have a splat to them which would have been more rounded had an English conductor and orchestra, steeped in the tradition, been at work. Part of this may be attributable, perhaps, to the recording technique, but part is probably attributable to Fiedler's — and the orchestra's — lack of long-term experience with the music. 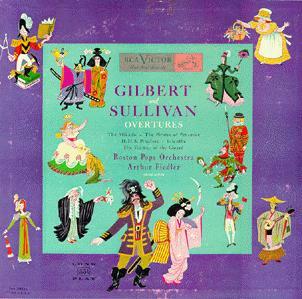 Fiedler and the Boston Pops did far better by Sullivan with their performance of the Overture di Ballo in 1970 on Polydor. Here is a suitably large-scale work played by a superb orchestra with a conductor who knew what to do with it. I saw a television broadcast of Fiedler conducting the overture to Mikado in the late 1970's, during one of his final seasons. By then, unfortunately, age had caught up with the conductor and both he and the orchestra were only going through the motions - and that not very coherently. The orchestra was as good as ever but they simply were not getting much leadership. It was a far cry from their recording of 1952; it lacked both the pluses and minuses of that gaudy, gloriously miscalculated production. Chris Webster, who has the version that comes with the musical comedy medleys, wrote: "I have only listened to the G&S side of this. There is a nice big acoustic feel, as if it was recorded in a large hall with a large orchestra. I think this was part of Arthur Fiedler's style. The orchestrations are fairly traditional, but I think the brass section is larger than usual, or else Fiedler has added extra brass bits. Other than this, there don't appear to be any liberties taken with the music. It sounds good, and I would like to find a copy in better condition, as this is one that I would play more often than the other 'early' overtures LPs." Bruce wrote to say that, in fact, it is a standard brass section, but given the lush sound that the Pops could produce, it's no wonder Chris wrote as he did. The liner notes are riddled with errors and grammatically are sometimes incomprehensible. They are by Franklin Pierce Adams, described as "...the legendary F.P.A., who for many years wrote the Conning Tower column in the New York World, New York Herald-Tribune and New York Post, and who was a permanent panel member of Information Please [a radio program] with Fadiman and Kieran." "...in 1934, when the D'Oyly Carte Company first came to New York..."
"These operas were conducted by Mr. Isidore Godfrey, who got the scores direct from Sullivan..."
"...The Yeoman [sic] of the Guard which overture mostly is 'Were I Thy Bride,'..."
"I suppose I like The Mikado record the best, for that overture not only begins with the opening of the first act — "If You Want To Know Who We Are," but it also ends with "The Moon and I," and with the lovely beginning of the second act, which is the loveliest chorus that Sullivan ever wrote — "Braid the Raven Hair." "I grow incoherent about those Fiedler records. They all seem excellent to me, and I have heard the D'Oyly Carte records made by the late Jessie Bond and Sir Henry Lytton, too." Mono 45rpm WDM 7006 Four 45rpm discs, auto coupled, containing the same five overtures. 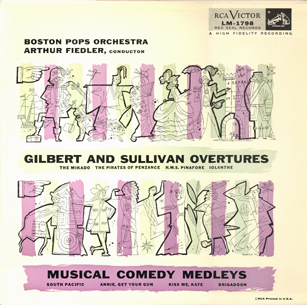 1953 RCA Victor Mono 12" LP LM 1798 Titled "Gilbert and Sullivan Overtures/Musical Comedy Melodies." Contains overtures to Mikado, Pirates, Pinafore, and Iolanthe on one side, coupled with medleys from South Pacific, Annie Get Your Gun, Kiss Me Kate and Brigadoon on the other side. ca. 1956-7 RCA Victor Mono 45rpm ERB-1995 Three 45rpm EP discs or one lp, an anthology titled "Getting Friendly with Music." 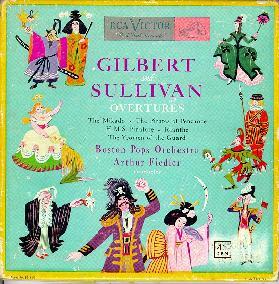 The overture to The Mikado is one of the included items, along with several others not by Sullivan.